FUNGICURE Athlete’s Foot Cream cures and prevents most athlete’s foot while relieving the itching, burning, irritation, cracking and associated discomforts. Maximum strength anti-fungal with flexible TargetTip™ applicator. Maximum Strength FUNGICURE Athlete’s Foot Cream combines maximum strength anti-fungal medicine with an innovative delivery system that uses a flexible, soft-tip applicator to get the medicine right between the toes where it can effectively fight most athlete’s foot infections. Your fingers will never need to touch the infection. Why is this important? Stubborn athlete’s foot infections typically start between the toes and can easily spread from contact. How long can I use FUNGICURE Athlete’s Foot Cream? You can use FUNGICURE Athlete’s Foot Cream for up to four weeks. If you don’t see improvement in that time, you should stop use and you may want to consult your doctor. If you are seeing improvement you may continue to use FUNGICURE Athlete’s Foot Cream until you are completely satisfied and/or for the prevention of future infection. What is the active ingredient in FUNGICURE Athlete’s Foot Cream? FUNGICURE Athlete’s Foot Cream contains 1% tolnaftate. What are the directions for FUNGICURE Athlete’s Foot Cream? The directions for FUNGICURE Athlete’s Foot Cream are to first clean the affected area(s) with soap and warm water and dry thoroughly. Then apply a thin layer over the affected area(s) twice daily (morning and night) or as directed by a doctor. For athlete’s foot and ringworm, use daily for 4 weeks. If condition persists longer consult a doctor. Be sure to read all Directions, Uses, and Warnings and follow them carefully. 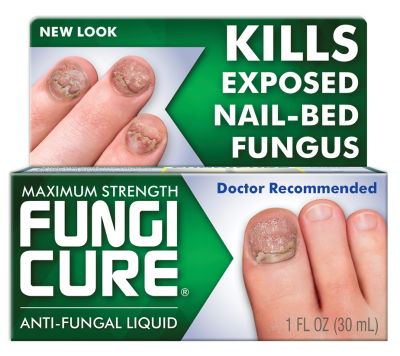 Can I use FUNGICURE Athlete’s Foot Cream to prevent a fungus infection? Yes. FUNGICURE Athlete’s Foot Cream can be used daily to prevent fungal infections. I have a fungal infection on my nails. Can I use FUNGICURE Athlete’s Foot Cream? FUNGICURE Athlete’s Foot Cream is only intended to be used on skin for athlete’s foot and ringworm. 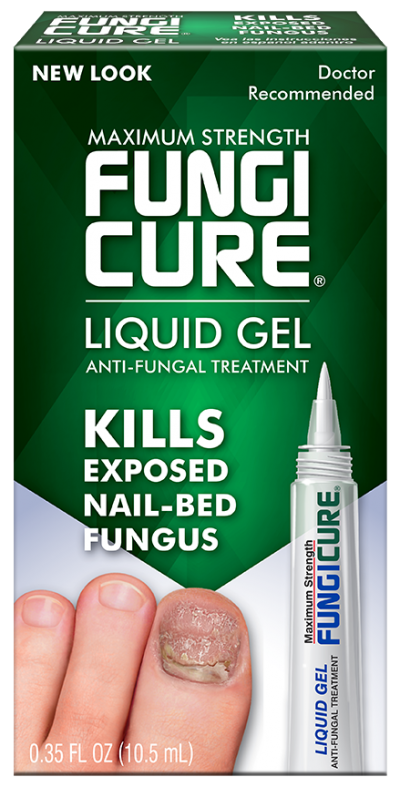 No OTC topical anti-fungal will penetrate hard intact nail surfaces. Why does the label for FUNGICURE Athlete’s Foot Cream say “not effective on scalp or nails”? The active ingredient in FUNGICURE Athlete’s Foot Cream has been recognized to be safe and effective by a FDA expert advisory panel when used as directed. It works to eliminate fungus infections of the body and feet. This includes athlete’s foot and ringworm infections on the skin. The FDA requires the statement “not effective on the scalp or nails” to appear on all over-the-counter anti-fungal products because the FDA has concluded that “such infections respond poorly to topical therapy, partly because of the depth of the hair roots and the thickness of the nails.” The FDA considers the nails to be a hard surface not penetrable by OTC topical medications. 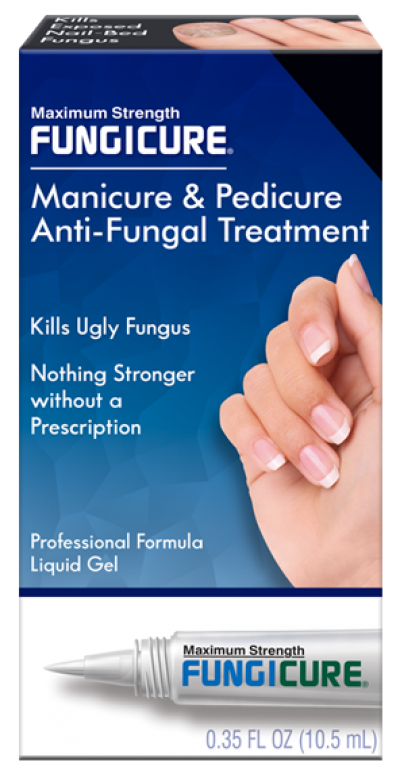 Keep your manicure or pedicure looking healthy with this maximum strength anti-fungal liquid gel.